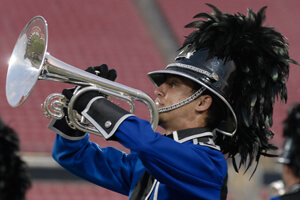 Drum corps are back in "The Ville" – It was a muggy afternoon Tuesday, June 23 when seven World Class corps took the field at Papa John's Cardinal Stadium in Louisville, Ky. 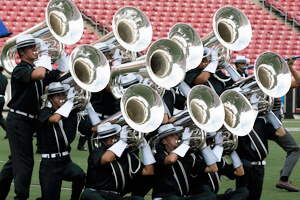 Though hot and sticky, standing ovations were aplenty from cheering fans who were excited for the return of Marching Music's Major League to Louisville for the first time since 2008. One attendee, Nick Conley, traveled from West Virginia with friends as part of a two-day drum corps road trip. "We had a couple of days off and tried to cram in as many shows as we could," he said. Conley, who says he has been attending DCI competitions since he was three years old, the day before had attended the DCI Tour Event in Charleston, W.Va. With seven World Class corps vying for the top score of the night, that honor belonged to the Bluecoats who took first place with a score of 75.600. Color guard captain Rachel Tracht says the corps' performance of its 2010 production "Metropolis: The Future is Now," in Louisville was consistent with the previous night's competition. Bluecoats Color Guard Captain Rachel Tracht and Drum Major Eric Humbert Story. This is the first time since 2007 that the Cavaliers (2nd, 74.200) have found themselves underneath the Bluecoats on the score sheets, though the Rosemont, Ill. corps was able to improve its score from Sunday in Ft. Mill, S.C. The Cavaliers' 2010 production "Mad World" includes music by Peter Graham, Pat Metheny and Charlie Chaplin. 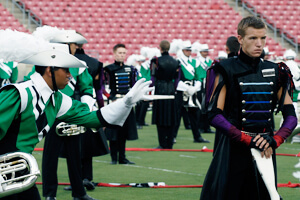 Only two-tenths behind was Phantom Regiment (3rd, 74.000) with "Into the Light," a program that drum major Jonathan Cao explains is an exploration of life from its beginning, through struggles and conflicts, and ending with the final passage 'into the light.' "It's like nothing we've ever done before in terms of the pacing and the theme, however, it still brings the passion and the emotion," said Cao. "Every ounce of our soul, our mind and body has to go into the end of this show." 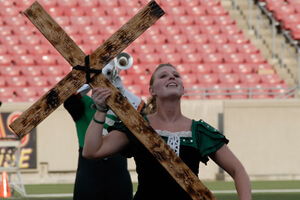 In fourth place was the Glassmen (71.200), with their show "The Prayer Cycle." The corps left Louisville right after performing to get on the road for a Wednesday morning concert on downtown Indianapolis' Monument Circle. In their first competition of the season, the Madison Scouts (5th, 71.100) brought audience members to their feet within the first minute of their performance. In 2010 the Scouts are performing several corps classics, including Richard Rogers' "Slaughter on 10th Avenue" and George Gershwin's "Rhapsody in Blue." The corps' new uniform, a throwback to the mid-1970s, has created some buzz with short sleeves. Madison color guard member Jecamiah Ybanez says that the corps has a renewed focus this season under the direction of an almost entirely new staff. "The way the staff put it to us from the start is that they wanted to reestablish the brand of Madison," said Ybanez. "They wanted to take things back to a very entertaining style, playing to everything that we are: We're an entertaining corps, we play to our fans, and we love our fans. We perform to perform." Teal Sound held its own with a sixth place finish (62.000). "It's cool to be competing up there with the big dogs in the World Class this season," said drum major Kayla Swift. She says that with 40 returning members this season, Teal Sound has a solid base of performers united in their goals. "It feels like we're closer," Swift said. "We are always reminded that we're World Class now and everyone has the same goal and a great work ethic." In seventh place was Pioneer (59.700). Though the corps' identity still remains unmistakable, Pioneer's "Corps Prayer" takes a slight detour from the traditional Irish music it has played over the last decade. Drum corps fans with a Fan Network subscription are getting a bonus today: Originally unscheduled for Louisville, on demand video playback of the complete performances of corps at Tuesday's event have been posted online. If you missed last night's show, all seven corps performances can be found under the "2010" tab on the Fan Network homepage. View a recap of scores from the DCI Louisville event. Watch Louisville performances on the DCI Fan Network. With assistance from Ryan Cain, Amy Fallon, Chris Weber.